In 1998, both of us felt a strong urge to make a fundamental change in our life after having worked in theatre for several years. We decided to take some time out to get clearer about what we wanted to do next. We boxed up our belongings and followed a long-held desire to travel in India. Before leaving, a friend gave us the address of the Ayurvedic physician and pulse reader Dr. Pankaj Naram in Mumbai and recommended that we visit his clinic. Not knowing anything about Ayurveda, but being inspired by what we had heard about Dr. Naram’s work, we planned to visit his centre for one or two weeks. These initial weeks turned into five life-transforming months in which we experienced how powerfully Ayurveda can support people in creating health, happiness and wellbeing. We studied pulse reading under Dr. Naram, worked in all departments of his clinic and saw thousands of patients being treated and getting amazing results. The positive changes we witnessed in these patients as well as in ourselves were so astounding that at the end of these five months we decided to become Ayurvedic pulse readers. Pulse reading is a diagnostic skill that allows an accurate assessment of what is happening in an individual’s body, mind and emotions, and how physical, mental and emotional levels interact. It enables the practitioner to arrive at a very deep and subtle understanding of the patient, which helps in formulating a specific and individualised treatment. Pulse reading is a practical art and science that is usually passed down from generation to generation within a lineage of Ayurvedic practitioners and in a close teacher-student relationship. Dr. Pankaj Naram learnt the art and science of pulse reading from Baba Ramdas who left his body in 1987 when he was, in his own words: “124 years young”. Dr. Naram had become a student of his ten years before, when Baba Ramdas was still seeing up to 80 patients per day and successfully treating them with Ayurveda. 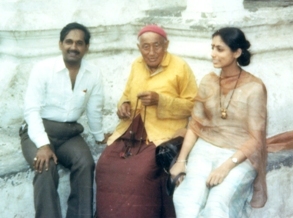 As part of the legacy from his teacher, Dr. Naram received thousands of pages of original scripts called the Siddhaved. These contain the experiences and healing secrets of many generations of Ayurvedic pulse readers, passed down from teacher to student in an unbroken lineage over the last 2,500 years. Today, Dr. Pankaj Naram is the current master teacher and 24th holder of the Siddhaved lineage. In 2000 we enrolled on a 3-year degree programme in Ayurvedic medicine at Thames Valley University in London. After graduating and completing two years of clinical internship at various hospitals, clinics and private practices in India, we started our own practice in 2004. 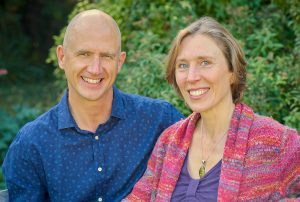 We have since also worked on behalf of the UK community of Ayurvedic professionals by helping to set up and administrate the Ayurvedic Practitioners Association (www.apa.uk.com). We are both still Full Members of the Association, but stepped down from Executive Committee responsibilities at the end of 2014 after 10 years of service. 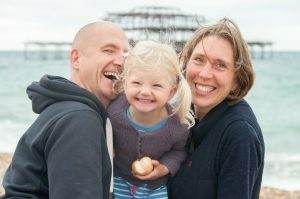 In 2006 we moved to Brighton on the south coast of England – and we absolutely love living here by the sea! We work from home in our practice called Ayuseva where we consult patients, give treatments, hold seminars and run workshops. Our practice Ayuseva is intended to provide opportunities for people to transform their lives on personal levels. With our work we hope to inspire people to allow their individual transformation to consciously and positively impact not only their family and wider community, but also our natural environment and human society as a whole. Our practice is a space for seva, giving and sharing. We offer solutions for creating health and well-being, and wish to facilitate personal insights and breakthroughs. Ayuseva also serves as a nucleus for the preservation and promotion of Ayurveda: it is a meeting point for practitioners, students and colleagues to share experiences, refine skills and inspire each other to live Ayurveda.